Lençóis, with an average altitude of over 3000 feet, lies 250 miles west of Salvador in the Chapada Diamantina mountain range running north-south through the state of Bahia. The population in Lençóis grew during the diamond boom in the mid 1800s, but began to decline as a result of the discovery of diamonds in South Africa. The residential architecture of the 19th century remains, designating the area a national monument. 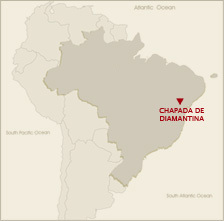 The Chapada Diamantina Region has been the subject of two extensive studies by the Royal Botanical Gardens in England for its unusual and varied flora. The mesas provide stunning views of the region and its innumerable rivers and waterfalls, including the tallest in Brazil, Fumaça Falls.